If you are nervous when getting on a plane, spend most of your trip praying or thinking of disastrous scenarios, over-amplify any strange sound the plane produces, or avoid flying all together- then you belong to the 30+ million people in the US alone, who suffer from some sort of fear of flying. This is a very serious matter that has negative impact on your personal and professional life, even your health. Avoiding a business trip can impact your career, avoiding a personal trip will strip you from the joy of seeing new places and vacationing with your family, and the stress will do wonders to your emotional and physical state. Numerous books were written on this subject, but most of them address the airline safety records. What they seem to unintentionally ignore is that these numerical data do very little to comfort you, the nervous flyer. Why is that? Because most of these books were written by regular authors or even airline experts who, in most cases, do not fear flying and cannot relate to your problem. Author and subject matter expert, Michael Salem, could have easily been the spokesman for the ‘fear of flying’ club, if such a thing existed. He was a genius at making up excuses just to avoid traveling by air, excuses such as medical issues; fabricated work schedules and meetings; visiting family, and even funerals of already dead family members. (He cannot even remember how many times his grandfather ‘died’ in order not get on a plane). Determined to free himself from this horrible fear, Michael started analyzing his fears, and interviewed many others who also fear flying. He collected data, experimented with different approaches, talked to pilots, read related articles, and much more. After roughly four years in the making, Michael developed what is now known as the ‘Brave Flyer’ teachings, which is a very effective approach to end someone’s fear of flying. Now, you cannot stop Michael from flying to new places, vising family and friends. Life is Great again for him- and he wants to share his success strategy. 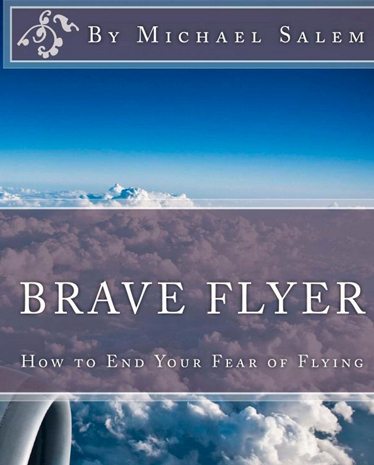 In this groundbreaking book, Michael takes a refreshingly different look at what is known to many people as Fear of Flying, a supposedly distinct and independent phobia related to being on a flying object, most commonly a plane. The book reveals that such a phobia does not even exist, which explains why most people who try to rid themselves of this phobia through conventional methods such as reading books or attending therapy programs, or through alternative methods such as hypnosis, fail. Simply put, they are trying to treat a non-existent phobia. So you ask yourself, ‘Why am I scared about being on a plane if there is no such phobia?’ Well, most people who avoid flying are not sure of the reasons why they are afraid to be on a plane. They think they suffer from a phobia known as “Fear of Flying”, because that’s what they were told or have read. If, and only if, they know exactly what is scaring them about being on a plane, the chances of overcoming that fear would significantly increase. Simply put, they would understand the root cause of their fear and be able to treat it. You see, what is known as a “Fear of Flying” phobia is nothing more than an end result, or a symptom, of one or more underlying fears that present themselves as a single phobia. Depending on the individual, these fears can be related to heights, loss of control, or enclosed spaces. In addition to the underlying fears, there is an equally important cause of fear of flying, and that is what is known as ‘external elements’. These are the very normal and routine events that take place before or during the flight that cause the anxious flyer to become more alert, such as the closure of the cabin doors, the fasten seat-belt light, or even the ‘ding’ sound that the pilot uses to communicate different messages. This mind bending and thought provoking book will force your brain to naturally start visualizing that flying is safe.